In the Amazonian backcountry, tribes are challenging construction of the world's third-largest dam -- by dismantling it. Here's what they can teach us about standing up to power. Last month, hundreds of indigenous demonstrators began dismantling a dam in the heart of Brazil’s rainforest to protest the destruction it will bring to lands they have loved and honored for centuries. The Brazilian government is determined to promote construction of the massive, $14 billion Belo Monte Dam, which will be the world’s third largest when it is completed in 2019. It is being developed by Norte Energia, a consortium of 10 of the world’s largest construction, engineering, and mining firms set up specifically for the project. The Belo Monte Dam is the most controversial of dozens of dams planned in the Amazon region and threatens the lives and livelihoods of thousands of Amazonian people, plants, and animals. Situated on the Xingu River, the dam is set to flood roughly 150 square miles of already-stressed rainforest and deprive an estimated 20,000 people of their homes, their incomes, and -- for those who succumb to malaria, bilharzia, and other diseases carried by insects and snails that are predicted to breed in the new reservoir -- their lives. Moreover, the influx of immigrants will bring massive disruption to the socioeconomic balance of the region. People whose livelihoods have primarily depended on hunting and gathering or farming may suddenly find themselves forced to take jobs as manual laborers, servants, and prostitutes. History has shown again and again that dams in general wreak havoc in areas where they are built, despite promises to the contrary by developers and governments. Hydroelectric energy is anything but “clean” when measured in terms of the excruciating pain it causes individuals, social institutions, and local ecology. The costs -- often hidden -- include those associated with the privatization of water; the extinction of plants that might provide cures for cancer, HIV, and other diseases; the silting up of rivers and lakes; and the disruption of migratory patterns for many species of birds. 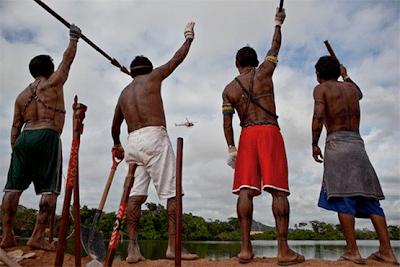 The indigenous cultures threatened by the Belo Monte Dam, including those of the Xikrin, Juruna, Arara, Parakanã, Kuruaya, and Kayapó tribes, are tied to the land: generations have hunted and gathered and cultivated the same areas for centuries. They -- as well as local flora and fauna -- have suffered disproportionately from the effects of other hydroelectric dams, while rarely gaining any of the potential benefits. Now they are fighting back. Indigenous leaders from these groups have asked the Brazilian government to immediately withdraw the installation license for Belo Monte. They demand a halt to work until the government puts into place "effective programs and measures to address the impacts of the dam on local people." They point out that a promised monetary program to compensate for the negative impacts of the mega-dam has not yet been presented in local villages; also, that a system to ensure small boat navigation in the vicinity of the cofferdams, temporary enclosures built to facilitate the construction process, has not been implemented. Without such a system, many will be isolated from markets, health care facilities, and other services. The cofferdams have already rendered much of the region’s water undrinkable and unsuitable for bathing. Wells promised by the government and Norte Energia have not yet been drilled. The list of grievances goes on and on and is only the latest in a very old story of exploitation of nature and people in the name of “progress.” Far too often, this has meant benefiting only the wealthiest in society and business. Yet here in the backcountry of Brazil, there is a difference: the makings of a new story. The indigenous people’s occupation of the dam garnered international attention, connecting their situation to other events across the globe -- the Arab Spring, democratic revolutions in Latin America, the Occupy Movement, and austerity strikes in Spain and other European nations. Brazil’s indigenous protesters have essentially joined protesters on every continent who are demanding that rights be restored to the people. Stories take time to evolve. This one -- the story of people awakening on a global level to the need to oppose and replace exploitative dreams -- is still in its beginning phase. And the first chapter has been powerful, elegant, and bold. It is time for each and every one us to follow that advice. Opposing the Belo Monte Dam project provides an opportunity for you and me to honor those words, and those leading resistance to it can help us understand the importance of looking around -- in our neighborhoods as well as globally -- to determine what else we can do to change the story.